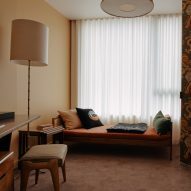 Creative duo Bella Freud and Maria Speake channelled the vibrant 1970s throughout the interiors of this London apartment, which has been designed by architect Piercy & Company inside the former BBC Television Centre. 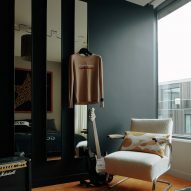 The two-floor apartment is located in west London's White City district within a Grade II-listed building that previously served as the headquarters for the BBC, but which has now has been overhauled by AHMM. 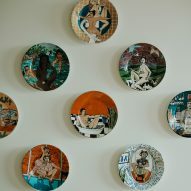 Designed by architect Piercy & Company, the apartment is one of five penthouses in the Architect's Series. 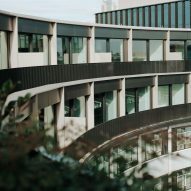 The scheme invited different architecture studios to design high-end homes within The Helios – a ring-shaped building in the complex. 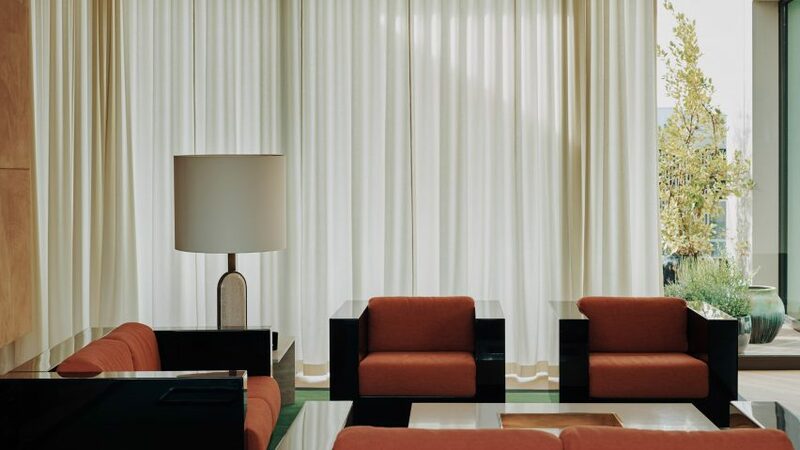 British fashion designer Bella Freud and Maria Speake – co-founder of Retrouvius, a design studio that specialises in salvaging furniture – were brought on board to complete Helios 710's interiors. The pair has previously collaborated for the revamp of Freud's own home and on the fit-out of the designer's flagship store in Marylebone. 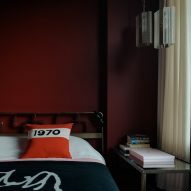 For this project Freud and Speake looked to the "bold colour, eclecticism and glamour" of the 1970s, decking out a majority of the apartment's living spaces in striking hues. 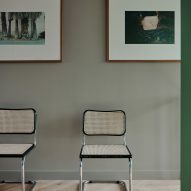 In the main living room, glossy black sofas with burnt orange seat cushions contrast against an emerald green carpet. At its rear is a long glass dining table surrounded by woven cane dining chairs, which complement the adjacent hessian-covered walls. Surfaces in the master bedroom have then been painted a deep cherry red. 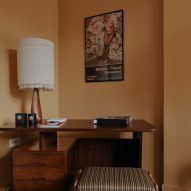 "Whenever Maria and I make a decision about a room, our conversations tend to be about how wonderful a certain colour is or about a beautiful artwork, rather than thinking about it too practically," Freud told Dezeen. "This was definitely an extension of the other spaces we have created together." A staircase with steps that cantilever out from the wall leads up to the kitchen, which has been completed in a decidedly more neutral colour palette – it features pale cabinetry, light timber flooring, and a grooved splash back crafted from white marble. At this level is also a cosy snug with cork walls and a sand-coloured suede sofa that perches on a fluffy rug. 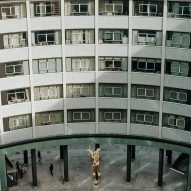 "The Television Centre is an iconic part of West London's history, which has been intertwined with my own life," explained Freud. "It was important for myself and Maria to retain the design integrity of the site." Part of the BBC headquarters has also been turned into a Soho House outpost, which opened in May this year. 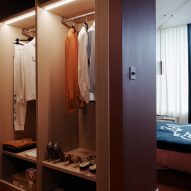 The private members club includes 45 bedrooms for overnight stays, a rooftop pool, cinema, and a huge gym that measures over 2,000 square metres. Photography is by Michael Sinclair.